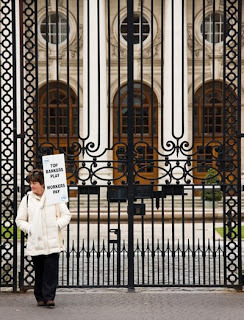 The Civil and Public Services Union played their trump card by going on strike today and guess what, the Earth did not stop revolving, Brian Cowen didn't explode and Brian Lenihan didn't come crawling to their picket lines covered in ashes and dressed in sackcloth. In fact, it might have just around my area but traffic did seem lighter this morning so I got into work quicker this morning. Maybe all this strike has done is highlight the fact that there are thousands of civil and public sector workers that aren't vital to running the country on a daily basis? At the very least if we get a few more strike days this year the budget deficit may be solved. Hi, I am working in the DSFA as a temporary clerical Officer. I have a degree, and many more educational qualifications plus a lifetime of experience both here and abroad. I have worked with the DSFA for approx one year. I earn €444 per week, I pay the 1% levy plus the 'pension levy' (being temporary I don't get pension contributions) which by the way has been enforced since 1st March. I take home approx €360, for that I work really hard dealing with very irate customers. I also witness first hand hard working dedicated staff, working along side staff who have a job for life and are riding the system. A complete overhaul of the system is badly needed. Decisions are made by faceless people that have no grasp of the quantities of claims and the amount of extra work the recession has brought about. They give temps as a stop gap and let them go just as they are trained and take on more temps, train them and leave them go. Those that make the decisions are shuffling people for the sake of statistics, defying all logic. Since this levy has been announced large numbers of the most senior staff are leaving - I say bring in Managers from the real world and get rid of those that can't see the wood from the trees. Forget striking the levy is in and it's here to stay.